We are excited because mom is off work today. I don't know if she ditched or if she is supposed to have off. Anyway, glad we got our hike in yesterday since it is already hot and it's only in the morning. I talked to the lady in Pittsburgh where I was born. She sent me and Lily my baby pictures. If you don't know, I lived there and then mom adopted me in December. I'm 2 now. I was supposed to be a show doggie like some of my family but I preferred to eat. I wanted to share these with you. Being a baby was fun. You could get away with more stuff. OMD! What a cute puppyyyyy you were! How did your ears come to stand up like that- do they do it on their own or do you have your pawrents do it like my mom's great dane friend did? You were/are so cute. Baby photos are the best! 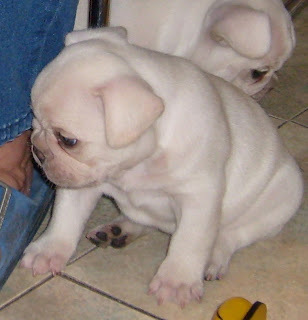 Ben, you were such a cute puppy! And you have grown into a very handsome 2-year-old! Oh man...you should hear all the high pitched squealing that mom is doing while looking at your baby pics! I think MY ears are going to stand up all perky like yours do after hearing this!!! Eeesh! We are curious to hear your answer to Pugs and Bugg's question too...mom was wondering the same thing. Wooos! Awwww..... such a cute puppy you were! And a Beawootiful adult too, I would know. Those pics are even more adorable than my puppy pics! wow, you were an AEOWABLE puppy! Awwwww, what a cute lil baby you were!!! 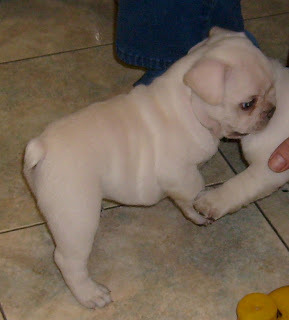 What a cute rolly-poly pup you were! Eating is so much more fun than being in the show ring anyway. 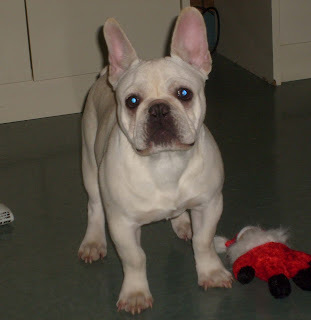 Gotta love the floppy ear puppy stage :) You were postively adorable Benny! 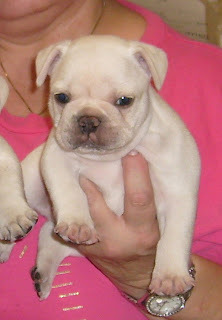 We hope our next Frenchie can be a creme like you!! OMD...What a cutie you were...and still are!! Come check out our new post!! You were picked to play Pay It Forward!!! Adorable! Thanks for sharing them! Oh you were such an adorable baby and you are beautiful now! Still adorable! You sure were round. I am with you on that whole puppy thing. They get away with all kinds of crap us big doggies can't. What a cute and adorable puppies you were!!!! Thanks for sharing withus these great pics of you!!!! Puppy life is the best!!!! What cute pups you were! Do your ears have to be cropped to stand up or does this happen naturally as you age?